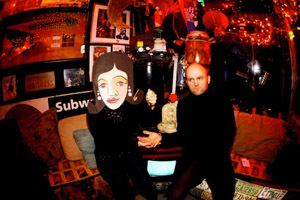 In early January Neoangin and his old aquaintance Psoy Korolenko get together to play in a Russian fish restaurant in the deepest corner of Brooklyn. They try to relive the performance of Gonki but either of them barely remembers anything. Nonetheless they haphazardly yet cheerfully improvise the evening. Neoangin is a guest at Jens Friebe’s revue at the Volksbühne in Berlin. Jim forgoes stage decoration only to come up with an almost postmodern idea: film the audience and project it on the screen behind him. Professor Thalhofer wants to document the whole spiel and places 10 video cameras all over the stage. All of this adds up to no good: Jim is irritated by all the cameras and the audience is irritated by its projection on the stage. Back in New York Neoangin plays a concert at the Alternative Art Fair, which takes place at the notorious Chelsea Hotel. Unfortunately no one had thought of renting a sound system, and so Jim ends up singing via the teeny loudspeakers from his own kitchen. At least it adds a very charming touch to the show. In order not to lag behind in the age of youtube Neoangin goes out and commissions a video. He asks the documentary filmmaker Margarita, who garnered international attention with her film about the gypsy punk band Gogol Bordello, to shoot a video for the song Happy Hobo. All involved parties agree on a script which is promptly forgotten by the director. Within just one day Jim single-handedly shoots, directs, acts and edits another video, this one to the song Frida Kahlo. The video gets a lot of plays on youtube, but also receives criticism by some Mexican chauvinists. . The upcoming tour through Europe doesn’t have the stars on its side. Only the very lovely evening in Liechtenstein and a 4-hour concert in Nürnberg remain highlights in Jim’s memory. Now about the not-so-good memories: some shows are cancelled very short notice, like the one in Toulouse. Or the police had just stopped by the venue and the concert had to start 4 hours earlier than planned—this happened in Madrid. In Paris and Vienna Nova Huta and Neoangin themselves are the root of their problems, by booking additional free shows in cozy basement clubs. Quickly they are caught in the middle. In Berlin the police puts and end to the show. At the Punisher Festival in Mulhouse an apparently drug induced fan lifts Jim onto his shoulders, only to lose his balance: both men come crashing to the ground. In Freiburg Nova Huta keeps his show to a minimum: after all, he is out of merchandise and doesn’t even like the venue. Within half an hour the space is empty. Slowly but surly the mood between Neoangin and Nova Huta begins to sour. . While everything is in order at the final show in the Kammerspiele in Munich, a break between the two one-man bands is inevitable. Ironically it marks the beginning of a very adventurous half year for Neoangin. A Russian filmmaker asks Jim to play in the road movie Shapito. The role: a gay version of himself. The shoot starts in Moscow, where Neoangin plays for 7 hours. The crew then boards a train to the little town Semeize in Crimea. In the 1960s Semeize had become notorious as a haven for the gay and hippy scene. Today one could call it the Ibiza of the East. Friend Pasha tags along as a travel companion and the two use the long brakes between filming to shoot some music videos, which are supposed to be part of the bonus material on the DVD of the movie. Unfortunately the global financial crisis puts an end to these ambitions. The film runs out of funding before the shooting is completed and the videos haven’t been published either. From the Crimea Jim zigzags through Europe. During his show in Copenhagen Neoangin destroys the one and only lamp of the club and has to finish his set in the dark. On his way to the gig in Bern he gets caught riding the tram without a ticket: after trying everything with the controllers Neoangin arrives an hour late to his own concert, but the whole incident rattled him up so much that his abundant energy infects the sold out club within minutes. In September Jim flies to Brazil for exhibits and concerts, all excellently prepared by Holger from Bungalow, who has been living down there for a few years. Jim paints the walls of Gallery Rojo in Sao Paulo and plays at the opening of the Tapas Club. A quick stop in Berlin is efficiently used to host a Friendly Capitalism Lounge. Then it’s off to Tokyo. 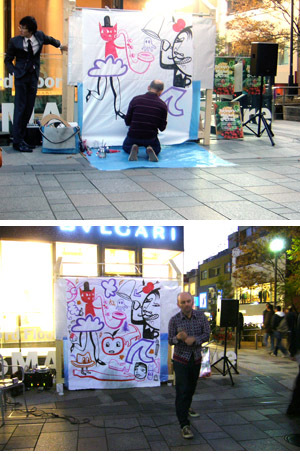 The DAAD had invited Jim to exhibit his work and play a show, and the chic club SuperDeluxe had also booked a concert. Then the club announces that Jim’s concert needs to generate at least $1,500 in revenue, otherwise the artist has to cover this amount out of his own pocket. Organizer Melanie panics and promptly generates additional PR schemes, aka mini-shows. And so it happens that one windy afternoon Jim finds himself singing and painting right in the middle of a busy shopping district. It marks the beginning of an amusing cat and mouse game with the booker. In the end SuperDeluxe is surprisingly well attended for a Monday night, and the joint live painting with the Japanese artist Utamaro turns out to be one of the highlights of the year. Upon his return to Germany Neoangin wants to end the year with a few shows in his native environs. For this purpose he has come up with some surprises. Unfortunately they aren’t well received everywhere. A cozy St. Nicolaus show with stories and trinkets from Tokyo is more or less bombs with the 200 or so party hungry teenagers in St. Gallen’s Palace. On the upside the show in Heidelberg is quite a success, mostly thanks to friend and cocktail mixologist Patrick, who tagged along for the cocktail tasting show. In Cologne Neoangin somehow leaves half of his equipment in the club, and in Stuttgart there are so many people that half the audience is stuck outside Club Waggon. But some genius spontaneously improvises another bar outside, and so the year ends on a happy note.